How have enterprises big and small both adapted their Operating Models? What are some of the chosen solutions from both inside the European Union (EU) and outside the EU? Is GDPR an opportunity for businesses to transform their Operating Models? Let’s not forget that GDPR is all about the PROCESS of how you manage Customer DATA through the entire value chain of your organization’s Operating Model … and PROCESS & DATA are the two key components of the Operating Model. I have previously written about how DATA has become a currency and our most valuable commodity… and with this post, you’ll start to see the importance of DATA and the implications of regulatory changes on DATA and the PROCESSES that control it. While many smaller businesses may appear to have less complex operating models and hence some may perceive that a regulatory change like GDPR might have little to no impact … it has been quite the contrary in reality. The answer of course lies in the Digital Economy. Cloud technology has removed the big technical challenge of most organizations from the 1980s and 1990s known as Service Oriented Architecture (SOA), which required a lot of investment in technical services and infrastructure that even the bigger businesses struggled to invest in. The Cloud has made a global network of services available to the masses of small businesses at a fraction of the cost. All of this is possible because of DATA and how we are using machines to perform more and more of our PROCESSES in our enterprises. So if you run a smaller enterprise, and you either offer your products and services through SaSS apps to customers, and/or you are using SaSS apps to support any of your business processes which handles any form customer data, then your Operating Model and hence your enterprise is impacted by GDPR. For some businesses like the Stratability Academy … as in my business, a professional services training company, that serves content online to customers supported by live in-person workshops, almost every process and our entire customer list, so all of our DATA, was actually impacted by GDPR. Luckily… for us and any smaller business that has not focused too heavily on push marketing through the mass email blast approach to sell to customers, the impact has been minimal. Oh… when I say minimal, this is of course relative… and by no means was the effort to implement GDPR with a small team across half a dozen or so SaSS apps small. It took us several weeks and many hours of hard labor to do this ourselves following the guidance from the ICO. The impact to our business as usual operating model was so significant, we literally stopped producing or doing anything else, such is the impact of GDPR for about 8 days. This is no different from a substantially large team of people (usually consultants) working on GDPR implementation in a large corporate, taking even longer, possible several months full-time to execute the changes required. Since inception, Stratability’s business model has focused on providing quality content to the right customers … those customers who are highly engaged with our content services, and who are keen to help us co-create so that they get the quality content and services that they actually want. Our approach to PULL quality customers towards our quality content, as we seek to capture and deliver customer lifetime value, means that our relatively small list of quality customers could be easily engaged to move over to our new Membership Portal where they can continue to access their quality content services, both free and paid. In fact, we sent our final email newsletter as part of our final non-GDPR announcements running up to the 25th May. Stratability like many other businesses who offer SaSS or Content just refocused or emphasized our operating model activities towards our subscription-based products and services and used our community driven engagement channels to communicate with customers supported by email. For prospects, we will rely on producing quality content that is SEO tuned to organically PULL new customer towards our services. It appears most larger businesses including Facebook, Amazon, Linkedin, Udemy, HSBC, all too similar approaches… In the case of HSBC, I can only speak for their online customers and what I witnessed as I examined the workflow online. I can’t speak for their other in-person channels, at least not in this post … which is about SMEs anyway. GDPR Solution No #2: Mass email your entire list to get people to opt-in again, and make a simple change to existing forms to introduce a new checkbox. I have been collecting feedback on this approach and it appears this has been the least successful, with many enterprises complain about a mere 5% response rate at most to their mass re opt-in email blasts. I won’t point outs those businesses who took this approach as perhaps this might lead to unnecessary embarrassment. Yes – there are many businesses who have not done anything. Some have simply stopped sending their email clutter to me … yeah, while others continue to do so. I’ve had one email service continue to send me emails, even after I’ve unsubscribed. It would appear that many of these are smaller businesses from outside the EU, who have simply chosen to ignore GDPR … Quite a few forum’s have included comments like … ‘Not another .com or Y2K thing’. It will be interesting how the EU and other regulators chose to police GDPR. As I said before, while its was more work to implement than I’d like, we at Stratability chose to implement GDPR … well, firstly because we are located inside the EU for now with Brexit still looming… and we certainly have many EU customers …. but mostly because we promote changes that allow enterprises to transform themselves for good. The objective of GDPR is to stop all the SPAM that’s been floating around, and customer lists from being sold illegally. For me personally, with a rather cluttered inbox, that’s a good thing, as I can now clean up all that clutter. For a business like Stratability, buying ads, and spending the time to write annoying overly long email newsletters was not something we want to focus our limited time and resources on. I previously wrote about the importance of providing value to customers first in the digital age, and GDPR actually provides enterprises with an opportunity to do just that… By making it much more difficult for poor services to be pushed via annoying marketing emails to customers that are just clutter in their inboxes, it is diverting time and resources towards those activities in the business that actually add value to the customer journey. GDPR while painful to implement, has provided companies like ours with a more leveled playing field and evened up the game, where we don’t need to compete using all those marketing tactics which were rather expensive and unaffordable for SMEs. You can compare this to Tesla’s marketing strategy… they don’t buy ads … and instead compete on their USP, using more direct channels and focusing their efforts on collecting as much data as possible to help improve their overall proposition to provide a remarkable service to customers. At Stratability, our focus post GDPR is on providing quality customer content and a remarkable co-creation driven customer journey. In the long run, I believe GDPR will help companies like Stratability, allowing us to compete on our USP and the quality of our services, rather than with our marketing budget. So, like Tesla, service design is key to our future success. In THE STRATEGY JOURNEY framework which we use ourselves as well as teach at the Stratability Academy, this move into service design based on the customer journey and co-creation is actually part of many of our courses, with 100s participants from enterprises big and small. 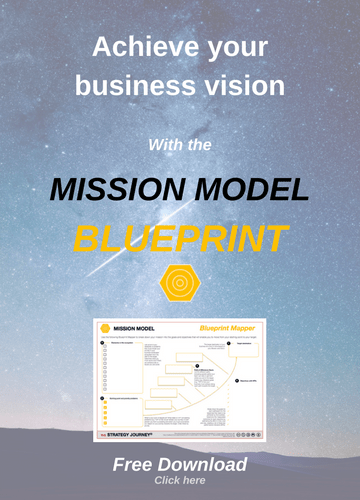 The framework includes 25 templates across 5 models which join together to help with an enterprise’s strategy-to-execution journey as they transform their business in the digital age. In my upcoming book, THE STRATEGY JOURNEY co-authored with Graham Christison (general release in November 2018), we will cover Tesla as a case study as well as providing worked examples of many smaller businesses using the 25 templates in the framework.